Trying to combine my two favourite hobbies of running and sewing in my free time, read all about my latest projects here! Wash the apples, peel them, and remove the cores. Put the apple pieces in a pan and add some water. The amount of water depends on your pan, for my pan which is about 15cm in diameter I add about 3cm of water. Cook the apple pieces for about 10 mins on a small flame until soft. See the pictures below for the progress. It looks more like sauce already! It has been an eventful week to say the least... As you may have noticed, I have only made the jeans since Sunday which is really not a lot for me considering my usual schedule and passion for creating. So I wanted to share my week with you, a week in which both good things and bad things happened. As seems to be the usual way to go, let's start with the bad things first. Here we go... *takes deep breath* Not only am I currently undergoing some stressful and seriously demotivating moments at work with regard some much needed recognition and all that goes with that (this started at the end of last week and is still ongoing), I have also been diagnosed with MS last Tuesday. Yes really... after months of tests and uncertainty, I finally have a result. Not quite the one I have been hoping for but nonetheless. I am still waiting for a second opinion and stuff but I have been told that it is 98.6% certain. Due to our dress code at work I could only wear them once a week and even then I kept tripping over the flared legs. Then, I had an idea :) The legs were wide enough to make a skirt and I also needed some new shorts. So I cut them up. Yes, I cut up my favourite jeans! But check out what I did with them. Today I wore the cardigan (it only took my 2 days to remember this word rather than 'vest' which is actually the Dutch word for it *hastily changes the word in yday's blog*) from yesterday's knit sweater makeoverto work and everyone loved it *huge happy smile*. They said it looked very officey :) And it was so comfy and the perfect warmth for our extremely airconditioned office. So it is definitely a hit! Am so pleased! It's my sister's birthday on Monday and due to the extremely busy week I had two weeks ago and my friend D. visiting last week for a few days (while I also had to work so was super busy trying to combine the two) I didnt really have much time to focus on her presents. I am trying to make presents as much as I can and I knew exactly what I was going to make for her :) As she also reads this blog, I cant give away too much, especially as I have only finished them today and they wont reach her until at least Tuesday (always late, me). But I took a couple of sneeky picture to give you an idea. Present #1, extremely cute idea I found in blogland. Link will follow of course when I can post the full pictures. I hope she'll like it! Present #3, also something I made once or twice before. 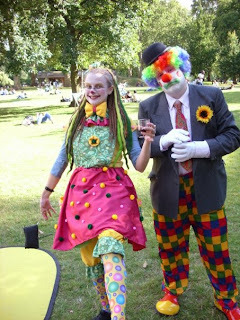 I actually won 'Cutest Clown' that year :) The weather was perfect and in the end we ended up in Trafalgar Square with a ton of clowns which was a hoot. I am a Dutch national living in London and have been for quite a few years now. I love creating things and visiting places, and blogging about my creations and my life here.